Many chemical compounds found in the Earth’s atmosphere act as “greenhouse gases.” These gases allow sunlight to enter the atmosphere freely. When sunlight strikes the Earth’s surface, some of it is reflected back towards space as infrared radiation (heat). Greenhouse gases absorb this infrared radiation and trap the heat in the atmosphere. Over time, the amount of energy sent from the sun to the Earth’s surface should be about the same as the amount of energy radiated back into space, leaving the temperature of the Earth’s surface roughly constant. 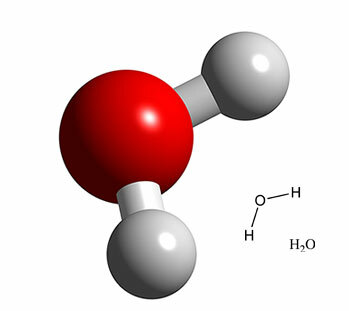 Many gases exhibit these “greenhouse” properties. Some of them occur in nature (water vapor, carbon dioxide, methane, and nitrous oxide), while others are exclusively human-made (like gases used for aerosols). 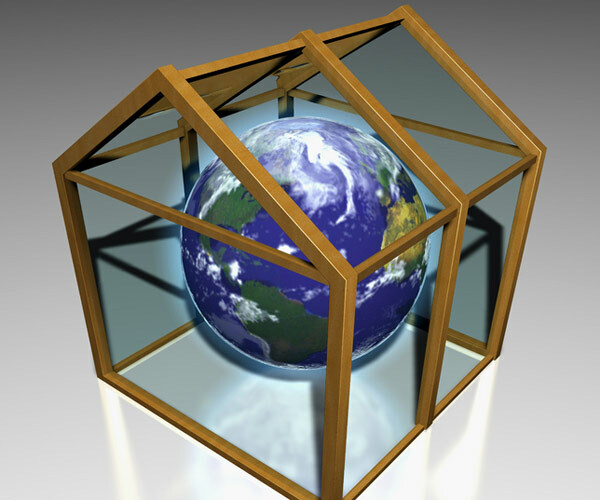 Naturally occurring greenhouse gases include water vapor, carbon dioxide, methane, nitrous oxide, and ozone. 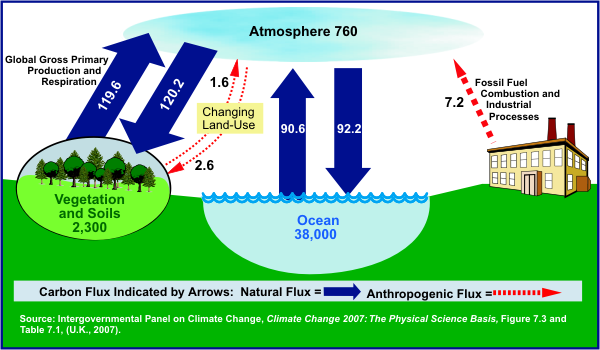 Water vapor accounts for the largest percentage of the greenhouse effect. 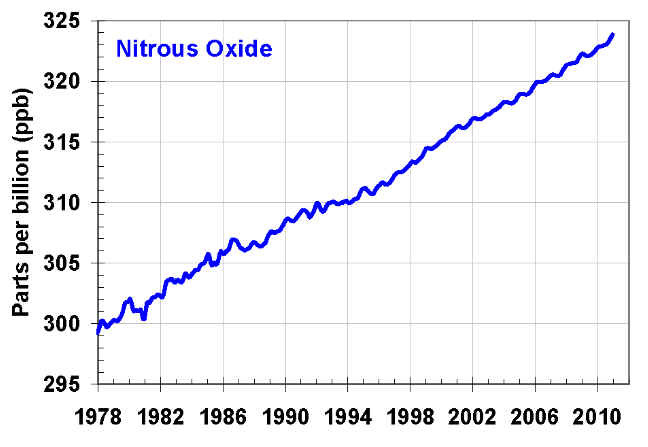 Earth's atmosphere is 78% nitrogen, 21% oxygen, and 1% other gases. 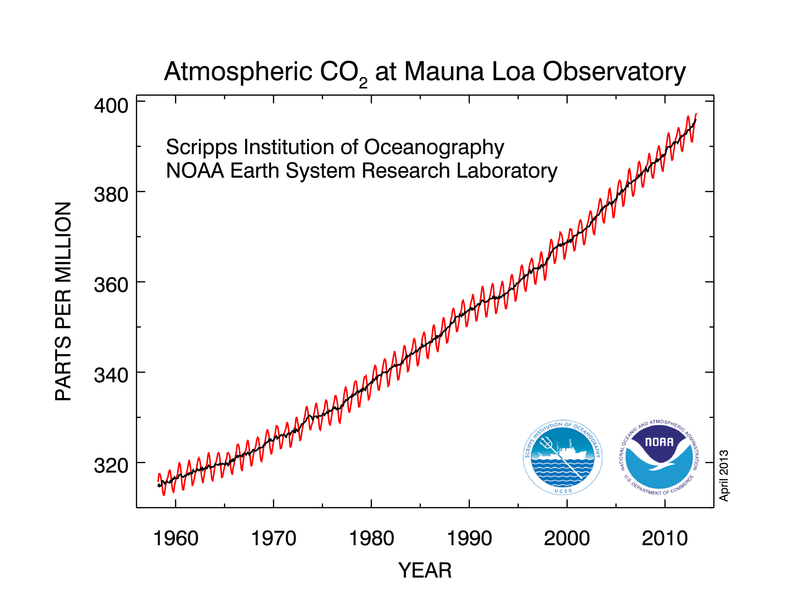 Carbon dioxide accounts for just 0.03 - 0.04%. Water vapor, varying in amount from 0 to 2%, carbon dioxide and some other minor gases present in the atmosphere absorb some of the thermal radiation leaving the surface and emit radiation from much higher and colder levels out to space. These active gases are known as greenhouse gases because they act as a partial blanket for the thermal radiation from the surface and enable it to be substantially warmer than it would otherwise be, analogous to the effect of a greenhouse. This blanketing is known as the natural greenhouse effect. Without the greenhouse gases, Earth's average temperature would be roughly -20°C. Each greenhouse gas differs in its ability to absorb heat in the atmosphere. HFCs and PFCs are the most heat-absorbent. Methane traps over 21 times more heat per molecule than carbon dioxide, and nitrous oxide absorbs 270 times more heat per molecule than carbon dioxide. Often, estimates of greenhouse gas emissions are presented in units of millions of metric tons of carbon equivalents (MMTCE), which weights each gas by its GWP value, or Global Warming Potential. The amount of CO2 released into the atmosphere in the next 30 years is expected to double or triple. 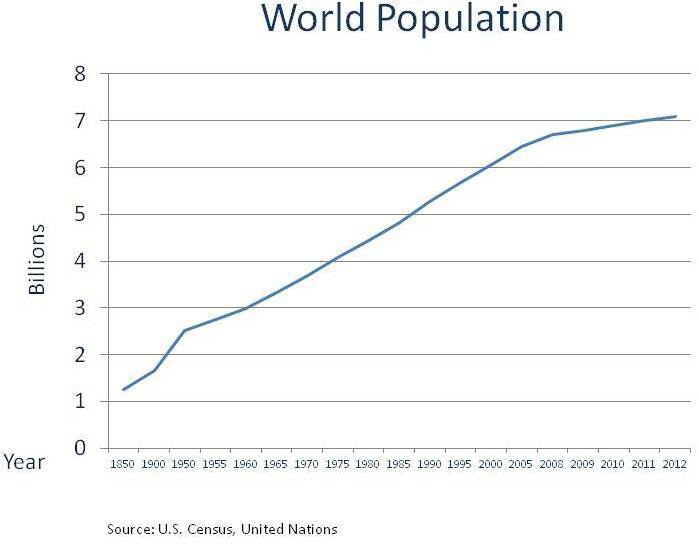 The number of cars in operation around the world will double by the year 2030. The natural production and absorption of carbon dioxide (CO2) is achieved through the terrestrial biosphere and the ocean. However, humankind has altered the natural carbon cycle by burning coal, oil, natural gas and wood and since the industrial revolution began in the mid 1700s, each of these actvities has increased in scale and distribution. Carbon dioxide was the first greenhouse gas demonstrated to be increasing in atmospheric concentration with the first conclusive measurements being made in the last half of the 20th century. Prior to the industrial revolution, concentrations were fairly stable at 280ppm. Today, they are around 370ppm, an increase of well over 30%. The atmospheric concentration has a marked seasonal oscillation that is mostly due to the greater extent of landmass in the northern hemisphere (NH) and its vegetation. A greater drawdown of CO2 occurs in the NH spring and summer as plants convert CO2 to plant material through photosynthesis. It is then released again in the fall and winter as the plants decompose. 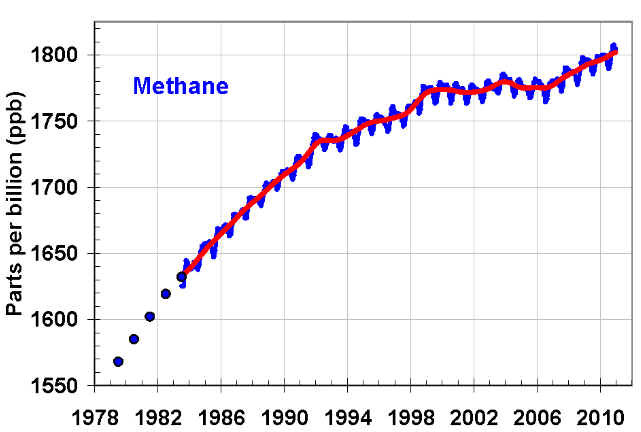 Methane is an extrememly effective absorber of radiation, though its atmospheric concentration is less than CO2 and its lifetime in the atmosphere is brief (10-12 years), compared to some other greenhouse gases (such as CO2, N2O, CFCs). Methane(CH4) has both natural and anthropogenic sources. It is released as part of the biological processes in low oxygen environments, such as in swamplands or in rice production (at the roots of the plants). Over the last 50 years, human activities such as growing rice, raising cattle, using natural gas and mining coal have added to the atmospheric concentration of methane. Ultraviolet radiation and oxygen interact to form ozone in the stratosphere. Existing in a broad band, commonly called the 'ozone layer', a small fraction of this ozone naturally descends to the surface of the Earth. However, during the 20th century, this tropospheric ozone has been supplemented by ozone created by human processes. The exhaust emissions from automobiles and pollution from factories (as well as burning vegetation) leads to greater concentrations of carbon and nitrogen molecules in the lower atmosphere which, when it they are acted on by sunlight, produce ozone. Consequently, ozone has higher concentrations in and around cities than in sparsely populated areas, though there is some transport of ozone downwind of major urban areas. Ozone is an important contributor to photochemical smog. Though the lifetime of ozone is short, and is therefore not well-mixed through the atmosphere, there is a general band of higher ozone concentration during NH spring and summer between 30?N and 50?N resulting from the higher urbanization and industrial activity in this band. Concentrations of ozone have risen by around 30% since the pre-industrial era, and is now considered by the IPCC to be the third most important greenhouse gas after carbon dioxide and methane. 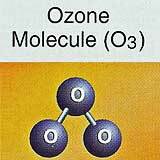 An additional complication of ozone is that it also interacts with and is modulated by concentrations of methane. 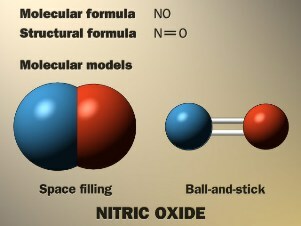 Concentrations of nitrous oxide also began to rise at the beginning of the industrial revolution and is understood to be produced by microbial processes in soil and water, including those reactions which occur in fertilizer containing nitrogen. Increasing use of these fertilizers has been made over the last century. and in addition to agricultural sources for the gas, some industrial processes (fossil fuel-fired power plants, nylon production, nitric acid production and vehicle emissions) also contribute to its atmospheric load. CFCs (chlorofluorocarbons) have no natural source, but were entirely synthesized for such diverse uses as refrigerants, aerosol propellants and cleaning solvents. Their creation was in 1928 and since then concentrations of CFCs in the atmosphere have been rising. Due to the discovery that they are able to destroy stratospheric ozone, a global effort to halt their production was undertaken and was extremely successful. 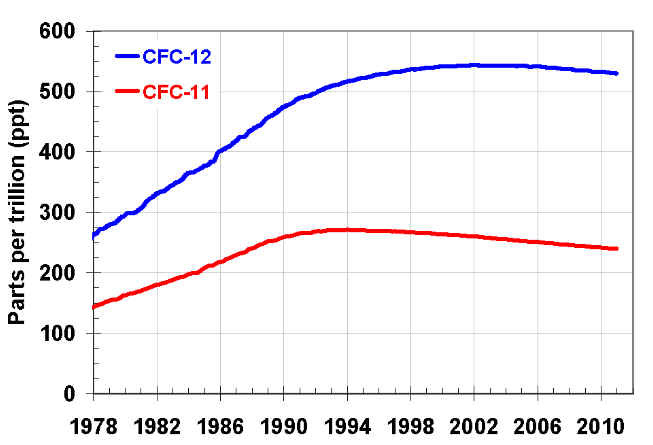 So much so that levels of the major CFCs are now remaining level or declining. However, their long atmospheric lifetimes determine that some concentration of the CFCs will remain in the atmosphere for over 100 years. Since they are also greenhouse gas, along with such other long-lived synthesized gases as CF4 (carbontatrafuoride), SF6 (sulfurhexafluoride), they are of concern. Another set of synthesized compounds called HFCs (hydrofluorcarbons) are also greenhouse gases, though they are less stable in the atmosphere and therefore have a shorter lifetime and less of an impact as a greenhouse gas. Carbon monoxide (CO) is not considered a direct greenhouse gas, mostly because it does not absorb terrestrial thermal IR energy strongly enough. However, CO is able to modulate the production of methane and tropospheric ozone. The Northern Hemisphere contains about twice as much CO as the Southern Hemisphere because as much as half of the global burden of CO is derived from human activity, which is predominantly located in the NH. Due to the spatial variability of CO, it is difficult to ascertain global concentrations, however, it appears as though they were generally increasing until the late 1980s, and have since begun to decline somewhat. One possible explanation is the reduction in vehicle emissions of CO since greater use of catalytic converters has been made.